Captain Saunders fishes the shallow water of Tampa Bay from a no nonsense flats skiff. He chose the East Cape Lostmen for its layout, fishibility, and shallow draft. The 18' skiff, the LuckyFly, affords anglers a stable, spacious deck to fish from, while being silent on the pole, and skinny. Incredibly skinny, chasing fish into water they drag their bellies in skinny. "That's the kind of fishing I love to do, skinny water, sight fishing for belly crawling redfish, and the East Cape Lostmen does all I ask of her and more." A 50hp Honda outboard drives the Lucky Fly, providing quiet and reliable power. 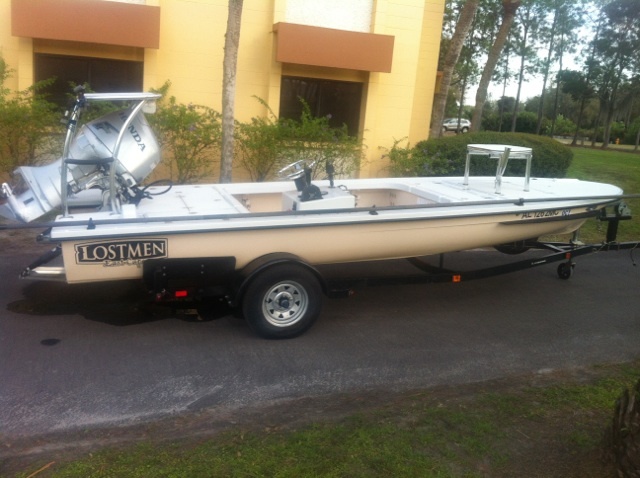 "I can't say enough good things about this skiff, she's skinny, stable, spacious, and a pleasure to fish from." Book your charter and come aboard to see for yourself.